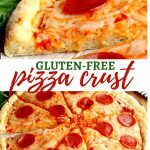 Make your own gluten-free pizza with this easy gluten-free pizza crust recipe! A thick and chewy gluten-free pizza crust that is also naturally dairy-free and Vegan. Ready for your favorite toppings! 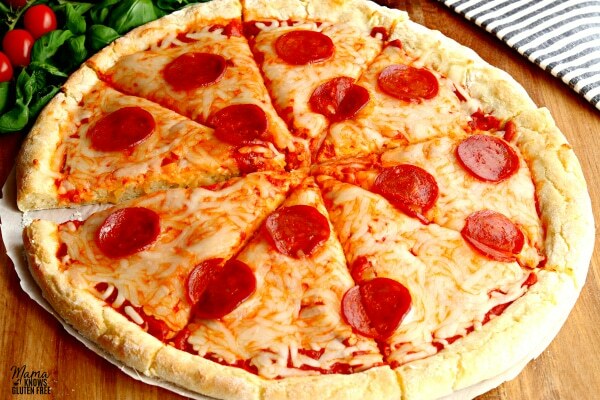 Pizza is one of my all-time favorite things to eat! 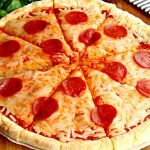 And, as most of you probably know, it’s really hard to find good gluten-free pizza whether it is a frozen gluten-free pizza or a pizza that is safe to eat from a restaurant. My family’s favorite frozen gluten-free pizza is from Costco. For a gluten-free and dairy-free frozen pizza, I like the Daiya pizzas, but they are expensive. Our favorite gluten-free restaurant pizza has been from Uncle Maddio’s and Blaze Pizza (they even have a dairy-free option). Oh, and I have not tried the Pizza Hut gluten-free pizza because they do not carry the gluten-free pizza crusts in the Pizza Huts in my town. So, I set out to make an easy gluten-free pizza dough that would be a thick crust gluten-free pizza. No more thin and crunchy gluten-free pizzas for my family! Start by making the easy gluten-free pizza crust. Pre-heat your oven to 100°F (the bread proofing setting). Once it gets to 100°, turn off your oven. Warm the water to 110°-115°F. I microwave the water in a large glass measuring cup for 30 seconds. I also use a thermometer to check the temperature. If your water is too hot it will kill the yeast. Add the honey to the warm water and stir until it is dissolved. Pour 1 tablespoon of gluten-free all-purpose flour onto a large sheet of parchment paper. 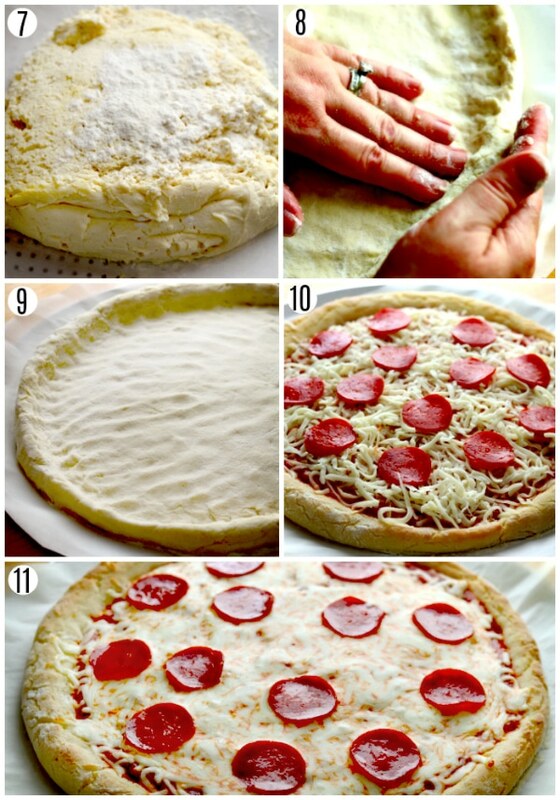 Spread into a circle the size of the pizza crust (15″). Store leftovers in an air-tight container. Reheat leftovers in the oven or microwave. 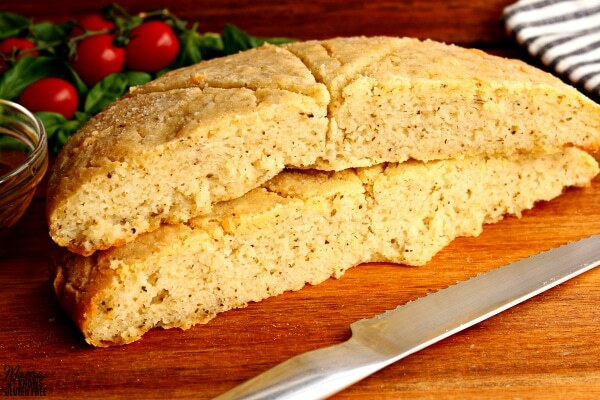 This gluten-free pizza crust can easily be made into delicious gluten-free Focaccia Bread. Just mix your favorite seasoning into the dough. I like 1/2 teaspoon of garlic powder, 1 teaspoon of basil, 1 teaspoon of oregano, and 1/2 teaspoon of rosemary. Shape dough into a circle on a greased or parchment lined baking sheet pizza pan (do not flatten like the pizza dough). Drizzle the dough with olive oil and sprinkle with sea salt (optional). Bake the bread for 25-30 minutes. Please watch your oven because all ovens are different. This gluten-free pizza crust recipe is naturally dairy-free and egg-free. So, that makes this both a dairy-free and gluten-free and a gluten-free Vegan pizza crust. I used Daiya Mozzarella Style Shreds in making my dairy-free and gluten-free pizza. Some of my favorite dairy-free alternatives that I like to cook with are almond, cashew or coconut milk. I also like baking with coconut oil or Earth Balance or Smart Balance butter. If you are tired of thin and crunchy gluten-free pizza crusts, then I’ve got you friend! My gluten-free pizza crust recipe is super easy to make and requires no kneading. The pizza crust is thick, soft and has just the right amount of chewiness. Making your own gluten-free pizza crust is so worth it! No more frozen gluten-free pizzas or overpriced pizzas from restaurants. If you are a pizza lover like me, you will love my recipe for gluten-free pizza. More Gluten-Free Dinner Recipes For You To Try! 2 1/2 cups gluten-free all purpose flour I like Pillsbury gluten-free flour. Not all gluten-free flours are created equal. You may experience different baking results depending on the gluten-free flour blend you choose. In a large bowl combine the gluten-free flour, xanthan gum (leave out if your flour already has it), instant yeast, gluten-free baking powder, and salt. Stir to combine the ingredients. Pour the warm water and honey mixture into the gluten-free flour mixture and mix with your mixer on low. (I used my stand-up mixer with the dough hook attachment). Pour the olive oil and apple cider vinegar into the dough mixture and mix on the medium speed for 3 minutes. The dough will be very sticky. Place dough in a greased oven proof bowl (I used olive oil cooking spray) and cover with plastic wrap. Cover the bowl with a towel and place in your warm oven for 30 minutes to rise. Remove the dough from the oven and preheat the oven to 425° F.
Pour 1 tablespoon of gluten-free all-purpose flour on to a large sheet of parchment paper. Spread into a circle the size of the pizza crust (15″). Turn the bowl over on top of the floured parchment paper. Gently pat the circle in an outward motion. 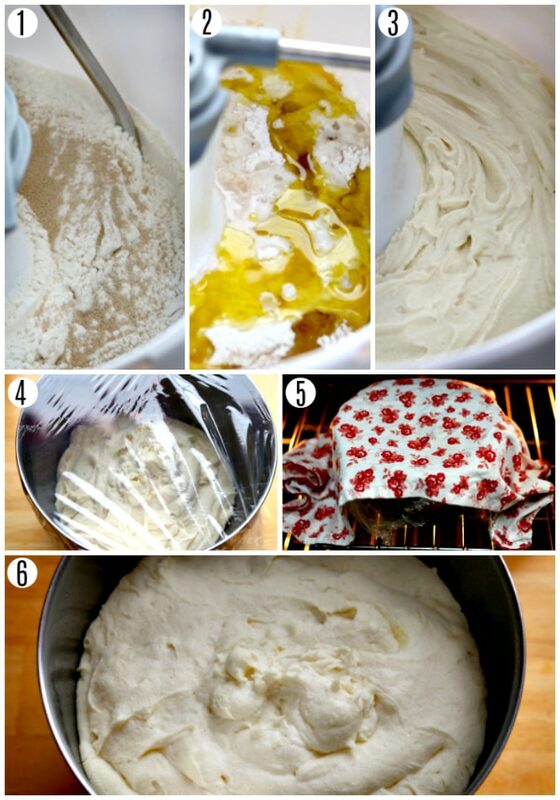 Work from the middle and push to spread the dough out to the edge to make a 15″ circle. Use your fingertips to press down into the dough to form the crust edge. Use your hands to finish shaping and rounding the edges. Place the parchment paper on a pizza pan or baking sheet. Bake for 15 minutes. 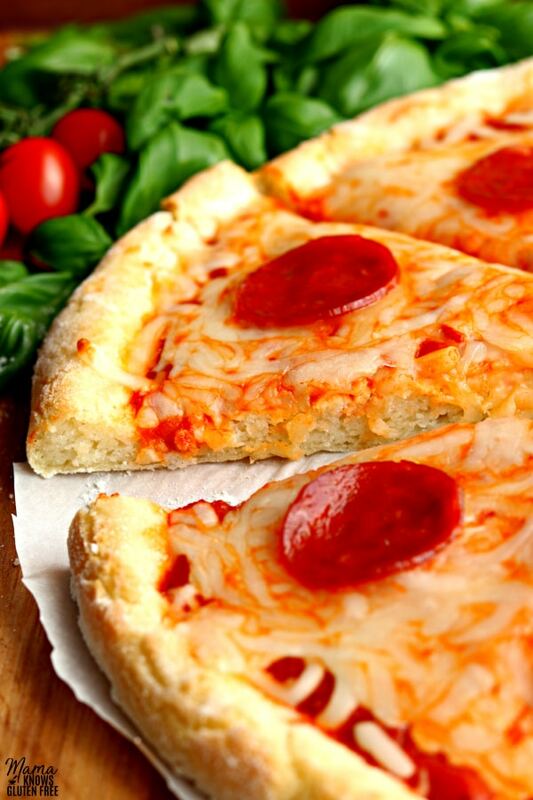 Remove the pizza crust from the oven and top with the gluten-free pizza sauce, cheese, and your favorite toppings. Bake for another 5 minutes, until the cheese, is nice and melted and the crust is golden brown. Allow the pizza to cool a little before slicing the pizza. Enjoy! For the dairy-free/Vegan option I used Daiya Mozzarella Style Shreds. This pizza recipe also makes great Focaccia bread. Please see the post about making Focaccia bread. Store left-overs in an air-tight container. Reheat leftovers in the oven or microwave. Thank you so much Marcia for the wonderful 5-star recipe review! This makes my heart so happy to hear that you and your daughter enjoyed the pizza. Please tell your daughter to thank you for the compliment that this crust tastes like Uno’s gluten-free pizza! You are so welcome I love sharing what I make for my family. Thank you again! Made it last Friday and making it again tonight! I changed up the flours as I used what I had on hand and it was still delicious. I am so happy that you enjoyed the pizza again Trish! Can you please let me know which brand of gluten-free flours did try with the recipe? I am always like to see what other people are using. Thanks! I’ve made a few of your recipes and enjoyed them all. Yours is one of my ‘go-to’ sites. One question for you on this pizza crust recipe. I see 1 Tbsp baking powder in the list of ingredients, yet not in the instructions. Does it get added to the flour, salt & yeast? Hi Theresa! Yes you add the gluten-free baking powder in with the dry ingredients. Thank you so much for bring that to my attention. I am so happy that you enjoyed the recipe that you have tried. It really makes my heart happy that I am one of your ‘go-to’ sites! I hope you enjoy the pizza. This recipe is delicious. It makes a very thick and fluffy crust. It’s a little too thick for my liking so next time I’m going to cut the dough in half. If you’re craving pizza, this is the recipe to try. 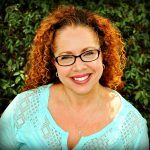 Hi Lourae thank you so much for the wonderful 5-star recipe review! I am so happy that you enjoyed the pizza. You could also make two smaller pizzas with the dough if you want a thinner crust.😊 Thank you again! and waiting for it to relax. I lightly salted the base then proceeded with Jeff’s recipe. Love your recipes Audrey!!! Keep them coming! Thank you so much Samantha for the amazing 5-star recipe review! I am so happy that you enjoyed the pizza. I have never had Detroit style pizza, but it sounds delicious! I LOVE pizza. I am definitely going to check out Jeff’s video. It makes my heart so happy to hear that you love my recipes. Thank you again for your kind words, the wonderful review, and your encouragement! Wonderful recipe- exactly what has been missing from my menu!! Thanks!!! Thank you so much Sage for the 5-star recipe review! I am so happy you enjoyed the pizza. I missed thick pizza crust too. You are so welcome, I love sharing what I make for my family. Thank you again! I love this pizza recipe. I’ve made it a few times and it never disappoints. Thank you so much Lourae for the 5-star recipe review! I am so happy that you love my pizza recipe. Pizza is one of my all-time favorites. Thank you again!